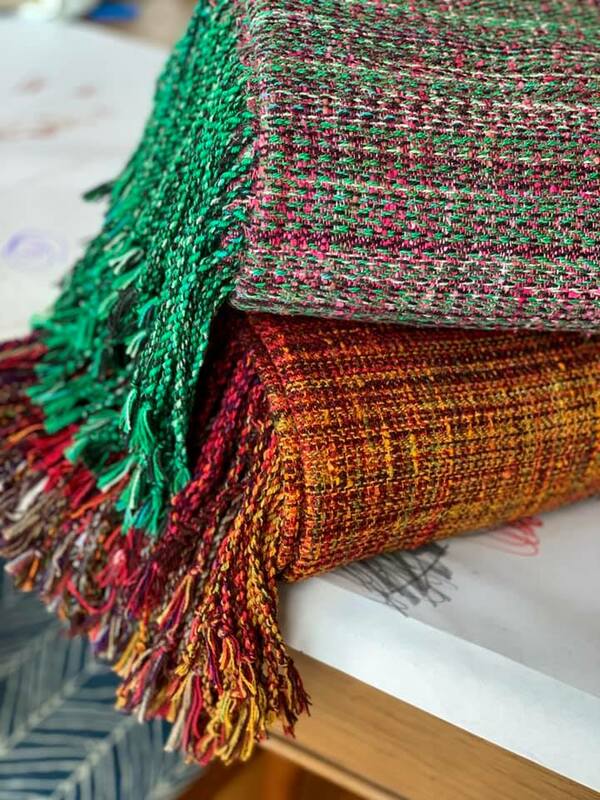 Welcome to all the details you need to know about custom and semi-custom handwoven orders with Ethos! Full custom and semi-custom orders are all dyed, handwoven, and finished in the US. We offer a super soft standard cotton warp with a variety of weft fibers and twill weave structures to choose from. Each person participating in an order has the opportunity to choose their own weft fiber, color, weave structure and length (along with some add-ons like fringe) for a truly customized piece. If you are new to the custom/semi-custom process please feel free to reach out (via Facebook or email) and ask a million questions, it can be a bit overwhelming if you’ve never ordered a custom before. Available weft fibers for wraps are cotton, cotton sparkle (silver, rose gold or copper), banana silk and merino/silk. Our cotton is soft and cushy and of course machine wash easy care. Banana silk is a plant based fiber that has a nice subtle silk-like sheen with lots of natural nubbiness and a bit of a wool-like wrapping quality that is incredibly toddler worthy and supportive. You’ll find banana silk to make a thicker blankety wrap that can be machine washed. Merino/silk is wooly and soft with incredible cush, you can truly wrap yourself in comfort with this medium/thick option that requires hand washing. Minimum length for a wrap is 3.2 meters with no maximum. Wraps measure approximately 28 inches wide (though it may vary a bit) with unhemmed/raw selvedges and the tails may be hemmed or fringed. We have partnered with Sleeping Baby Productions for ring sling conversions with 100% cotton only. All ring slings are sewn with their exclusive Eesti hybrid shoulder and your choice of metallic rings and come in 4 sizes, small (70 inches) medium (75 inches) large (80 inches) extra large (85 inches). Accessories are available with the following weft fibers: cotton, cotton sparkle, banana silk, merino/silk, bombyx silk and cashmere. Cowls are half width and measure approximately 30 inches around, you may choose extras like snaps or button for an additional cost. Shawls are full width by 2 meters long (or any specific length upon request) and may have either buttons or snaps added. Small convertible backpack totes measure approximately 12×15 while the large measure approximately 18×20 and are sewn with your choice of linen lining, webbing for handles and silver or gold hardware. 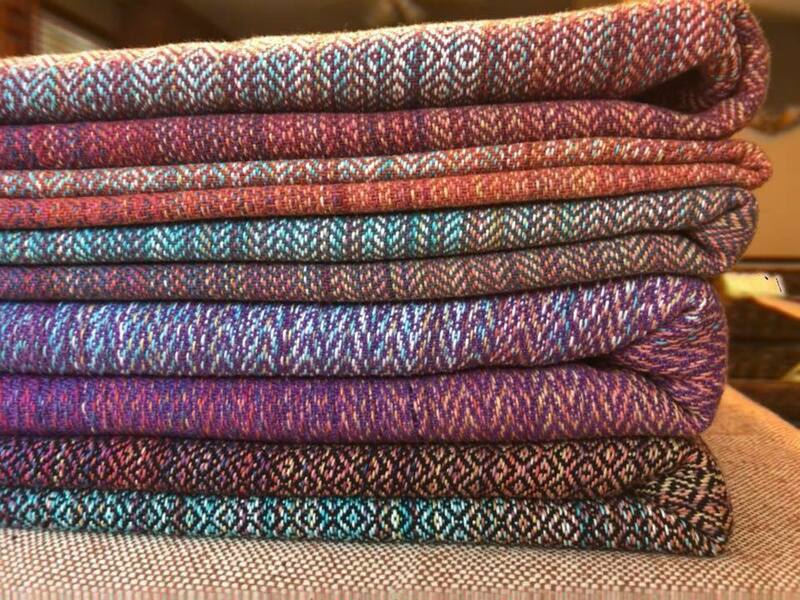 Turn around time on custom handwoven orders is typically about 3 months but it may vary depending on the size of the order. Accessories and ring slings require an additional 2-3 weeks for completion once fabric has been received at Ethos headquarters. Invoices for custom orders are issued via PayPal and require a deposit of 30% with the remaining balance due once orders are ready to ship.